Balbir Store - Ecommerce Shop / Online Business of navy cotton suit with red panel design, navy cotton suit with potli style buttons & peacock cotton suit with plant motifs in Ludhiana, Punjab. Navy Cotton Suit with Red Panel Design. The Shirt is stitched with lining and is ready to wear. It has Red embroidery which makes it very graceful. In the box, is a Red Georgette Dupatta and 3 meters of Navy Blue Taffeta fabric for bottom. Has the proper Punjabi taste. Please Note: Only Ready-made articles can be altered according to the customer’s measurements free of charge. Stiching of Semi-stitched or Un-stitched articles will be charged. To submit your measurements for alterations or stitching, click on the Custom Made option and then hit the Submit button. Navy Cotton Suit with Potli Style Buttons. The Shirt is stitched with lining and is ready to wear. The shirt also has placement embroidery. Comes along with a Navy Dupatta and 3 meters of Navy Taffeta fabric for bottom. Has the proper Punjabi taste. Peacock Cotton Suit with Plant Motifs. The Shirt is stitched with lining and is ready to wear. Knot Work has been done on the Shirt which is specialized in Kolkata, India. In the Box is Peacock dupatta and 3 meters of Peacock Taffeta fabric for bottom. Peach Embellished Sharara Suit with Contrast Dupatta. The shirt has Paisley embroidery and is made on Silk. The Sharara has gold embellishments. Comes along with a beautiful Majenta Dupatta. Has the proper Punjabi Taste. Sharara suit in Peach and Sea Green Contrast. The Shirt is embroidered and highlighted with Swarovski. The Sharara is made on Sea Green color and has Gold embroidery. 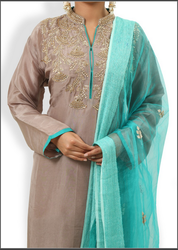 Comes along with a Sea Green Georgette dupatta. The Suit itself has a very minimalistic but graceful design. Has the proper Punjabi taste. 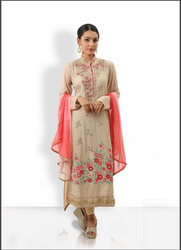 Peach Silk Suit with Heavy Embroidered Dupatta. The suit itself is made on the smoothest Silk. It is embellished with Gold accents. The Dupatta is contrast to the suit and is embroidered all over. The Suit looks very gracious all together. Comes along with 3 meters of Peach Taffeta fabric for bottom. Has the proper Punjabi taste. Apple Green Sharara Suit with Pink Embroidery. The Shirt is made on the smoothest silk in Apple Green color. It is highlighted with Pink embroidery and Tassels. The Sharara is stitched and is also embroidered. Comes along an Apple Green Georgette dupatta. Has the proper Punjabi Taste. Embroidered Long Suit with Plazo and Dupatta. This articles comes with a stitched plazo and a dupatta. It is ready to wear out of the box. The shirt is also stitched with lining. The Gold Embellishments really highlights the piece. It is the fusion of Punjabi Style with Modern Designing. Grey Embroidered Suit with Firozi Dupatta. The Shirt is embellished with the finest Kundan. The Dupatta has a nice contrast color with Gotta Patti work. Comes along with 3 meters of Grey Taffeta fabric from bottom. This article comes from our Summer Select’18 collection. Has the proper Punjabi Taste. Lucknow Work Suit in Ivory shade with Coral Dupatta. It is made on the Summer Fabric Georgette. The Lucknow Work aka Chicken Kari with Multi Colored Thread looks very stylish. In the box, you will get a Lucknowi Shirt, Coral Dupatta and 3 meters Ivory Taffeta Fabric for bottom.